Halfway into 2018, Telenor continues to attract customers and deliver solid performance. In the second quarter we saw robust operations in Scandinavia, particularly in the mobile market in Norway. In Malaysia, we achieved revenue growth for a second consecutive quarter as a result of our determined repositioning efforts. In Pakistan and Bangladesh, we grew the subscriber base and strengthened our positions in rapidly developing markets. 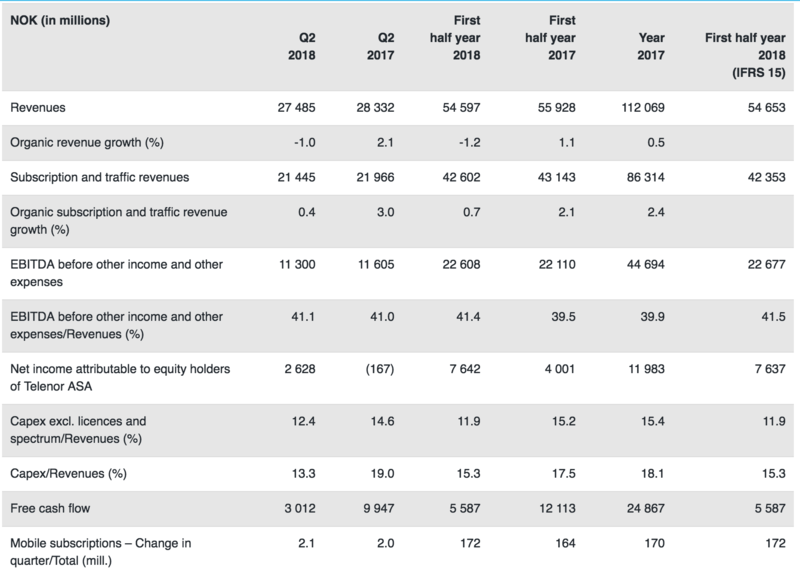 Telenor added two million mobile subscriptions in the quarter, and now connects 172 million customers. Our operation in Thailand continues to deliver robust results, while transforming the business and building a solid platform for the future. Across our operations, we continue to execute on simplification and increasing efficiency, while maintaining market positions. These efforts are generating good results, with savings now of a more structural nature. Year to date, opex has been reduced by close to NOK 1 billion. Going forward, we will build on the good momentum and continue to create value by focusing on growth, efficiency and simplification,” said Telenor Group President & CEO Sigve Brekke. Discontinued operations: Telenor India, Hungary, Montenegro & Serbia and Bulgaria, Telenor Common Operation, Telenor Microfinance Bank and Telenor Banka. On an organic basis, subscription and traffic revenues grew 0.4%, while total revenues decreased by 1%. Total reported revenues were NOK 27.5 billion, which is a reduction of 3%. Reported opex decreased by NOK 0.5 billion. On a constant currency basis, the reduction was NOK 0.2 billion or 2% and NOK 0.4 billion when also adjusting for one-time items last year. EBITDA before other items was NOK 11.3 billion, corresponding to an EBITDA margin of 41.1%, which was stable, compared to last year. Organic EBITDA growth was 0.5%. Net income attributable to equity holders of Telenor ASA was NOK 2.6 billion, or NOK 1.78 earnings per share. Capex excluding licences and spectrum was NOK 3.4 billion, resulting in a capex to sales ratio of 12%. Free cash flow for the quarter was NOK 3.0 billion. In June, Telenor initiated a share buyback programme for up to 29 million shares, equivalent to about 2% of the registered shares. The programme will return about NOK 5 billion to shareholders. For 2018, we maintain our expectations of an organic subscription and traffic revenue growth of 1-2%, and an organic EBITDA growth of 2-3% with a capex excluding licences and spectrum of NOK 17-18 billion.